You may be familiar with supply and demand, but have you considered how it impacts your everyday life? Commodities such as food and fuel are strategically released into the market based on supply and demand, and this influences how much you pay. Fuel is one of the most unstable commodities in the market. We are constantly impacted by small fluctuations in fuel pricing that we may not notice because of how incremental it may be. 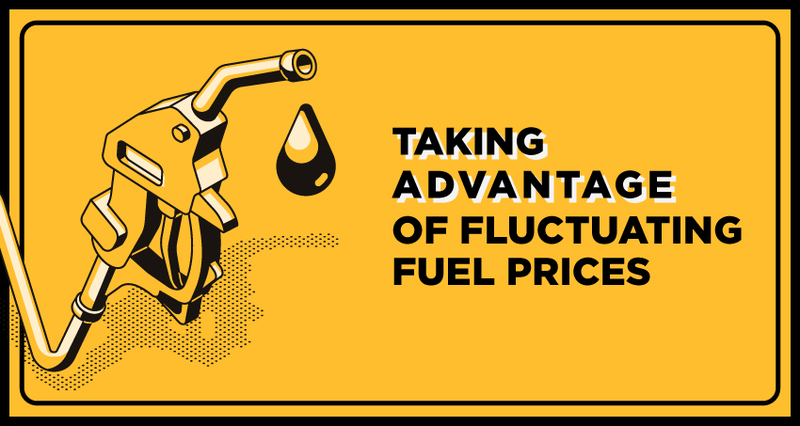 However, getting into the habit of monitoring fluctuating fuel prices could end up saving you money. To learn best practices for fueling up, it’s first important to understand why fuel prices are constantly changing. For that, we must look at what it takes for fuel to even hit the market. Crude oil goes through a refining process before it hits the pumps. Before it makes it to the refinery, many oil producers analyze the market and will either produce more oil or hold some back. In essence, the main players in oil production can create that supply and demand by stocking up or inducing a flash sale. By the time the oil hits the refineries, we still have to figure out the end product as there isn’t just one type of fuel. Unleaded, diesel, racing, airplane and many other types of biofuel compete in the market. For example, if you live closer to sea level you have more O2 in the air, which helps combustion. This also means engines are more prone to pre-combustion due to the added O2. To combat this, fuel additives are put in to help prevent that pre-combustion. This can alter the price for fuel in that area that may not impact other areas of the country. All of this information is considered before taxes are applied. States have taken an interest in the taxes needed from each gallon pumped in order to maintain their cities. This means that every time you fill up, you are not only paying for the cost to make that fuel, but also for highway maintenance, new construction and the federal government’s slice. Fuel prices also vary based on the convenience of the location of the fuel station. If you’re stopping at a fuel station on a main thoroughfare, prices are likely to be 20% higher. The more difficult it is to get to the fuel station, the more you’ll save on fuel prices. Understanding the process of establishing fuel prices can allow you to be more strategic about where you choose to fuel up. To locate the best fuel price near you, use a provider that offers an app with fuel station location capability. This will help as you watch for fuel stations that allow you to save a precious few cents on each gallon. To get the most bang for your buck, you may also consider joining a fuel rewards program. Learn more about savings and other perks available to fuel rewards program members in our article titled Fuel Your Travel with Rewards. Utilizing these tools and knowing what you know now, you may find yourself paying close attention to the dollar signs advertised on the side of the highway before you fill up on that liquid gold.